Musing on the colour scheme. I think a darker base would be a good idea, I think I went too heavy on the highlight and low light and the basecoat doesn't really come through. I was hoping I wouldn't have to highlight them with a brush but I think it would be worthwhile doing that and shading them too. I've bought some vallejo US olive drab, and dark yellow in the hope that I won't have to mix my colours. If that doesn't work I think I'll just mix a fair bit and put it in dropper bottles so that I have the same colour across the army and don't have to mix it everytime. GW bugman's glow is VERY pink, going to need to tone it down a bit with some brown. 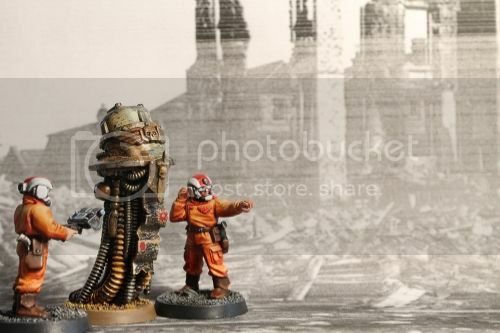 I'm currently figuring out how to paint my imperial guard and would really appreciate some advice. I want the troups to look like these guys. It's like this horribly beautiful intense brown-green. I think I'm slowly getting there. Although it is a faff to do because it involves lots of mixing paint. Instead, I've tried to use the brown ink as a glaze to introduce more of the brown colour from the concept images. I prefer the colour on the middle figure the most, but the highlights and low lights still aren't 'popping' like they do in this image. The double glaze just looks a bit messy and too dark. So I think i need to put an extra highlight and shade in there before I do the wash. I think it's because I did zenithal highlights with an airbrush which flattens the top when viewed from above. And I might just use diluted black for the darkest shadows on the shade as it's already pretty dark. But, I'd LOVE a simpler option if any one has any ideas.